By growing strawberries (or other plants) vertically rather than horizontally, you are able to fit several times the number of plants into the same area footprint and the same volume of soil. As added benefits, your horizontal farm will be portable, hangble, mountable and stackable! In the following video example, LDSPrepper plants 20 strawberries into a 1 square foot footprint, which would otherwise take 6 square feet or more of room. He uses several other techniques such as sub-irrigation and automatic watering, which we will cover in another post. 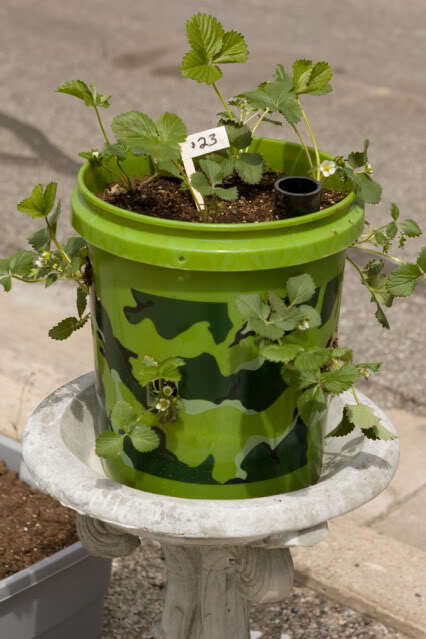 A standard 5 gallon bucket has room for 20 holes, supporting 20 strawberry plants. The holes are punched out with a 1 3/4″ hole saw. The lowest holes begin 3 1/2″ from the bottom of the bucket, and are spaced out every 6″. Watch the video for a more visual explanation of the correct hole dimensions and spacing. Watch our new Gardening with 5 Gallon Buckets video for more ideas like this. I was wondering could you over winter the strawberry bucket in a greenhouse so as not to have to replant them every year? I don’t see why not – A benefit of growing in buckets is how portable the whole lot is. I’ve also known people to rotate their bucket gardens around to give all plants equal sun. Do i water from the top if i dont use the bottom shirt idea? 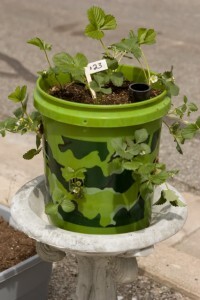 I would advise using a pvc pipe and drill small holes in it, put it in the middle of the bucket and that way when you water and fertilize from the top it gets evenly distributed, and the strawberries that are planted on the top of the bucket will eventually grow to cover the pipe top from plain view. BUT you know it’s there. He uses a t-shirt for water transfer but u can not find the first video he mentioned that talks about that?? Can I use the 5 gallon bucket without putting the holes in the sides? And what should I put on the bottom for drainage? I’m new at all this.